Training, continuing education, certification, and field support are keys to the development of NBC-affiliated test and balance firms. 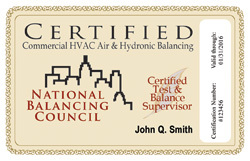 NBC certification identifies affiliated firms and Certified Balancing Professionals as qualified in professional methods and procedures for testing, adjusting, balancing, and commissioning commercial environmental systems. If you are interested in NBC certification, you must first meet basic pre-approval criteria. Complete and submit a Preliminary Application. If you qualify, NBC will extend an invitation to apply for certification. All NBC-affiliated firms must have at least one certified TAB Supervisor on staff. The TAB Supervisor is responsible for overseeing all aspects of the balancing project; reviewing and certifying TAB reports; and providing supervision and training of technicians. To be eligible for the NBC TAB Supervisor Certification, the applying individual must have a minimum of five (5) years of TAB field experience. In addition, individuals must successfully complete training and pass three (3) exams in air and water balance and balancing project management. Among other skills, they must demonstrate the ability to utilize fan and pump laws, properly use applicable instrumentation, apply psychometrics, and determine actual delivered BTU performance of equipment that they have tested. They must also demonstrate the ability to identify system defects and deficiencies, and recommend possible remediation utilizing methods including CSER© (Cooling System Efficiency Reports) and HSER© (Heating System Efficiency Reports). Successful candidates are issued a TAB Supervisor Certification number, wallet identification card, certificate, and certification stamp. Only the NBC Supervisor may stamps reports. Candidates must successfully complete training and pass two (2) exams in air and water balance. Among other skills, they must demonstrate the ability to utilize fan and pump laws, properly use applicable instrumentation, apply psychometrics, and determine actual delivered BTU performance of equipment that they have tested. Successful candidates are issued a TAB Technician Certification number, wallet identification card, and certificate. 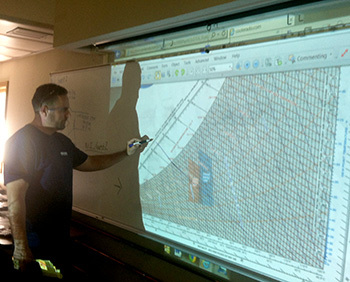 Applicants for both Supervisor and Technician recertification must complete a recertification course every two years. They must demonstrate continued ownership of all required tools and instruments, with current calibration certificates, and also submit copies of balancing projects completed during the preceding two years. For more information about Recertification, click here.